Check out time at Rock Crusher wasn’t until 1 pm so we weren’t in a great rush to leave. 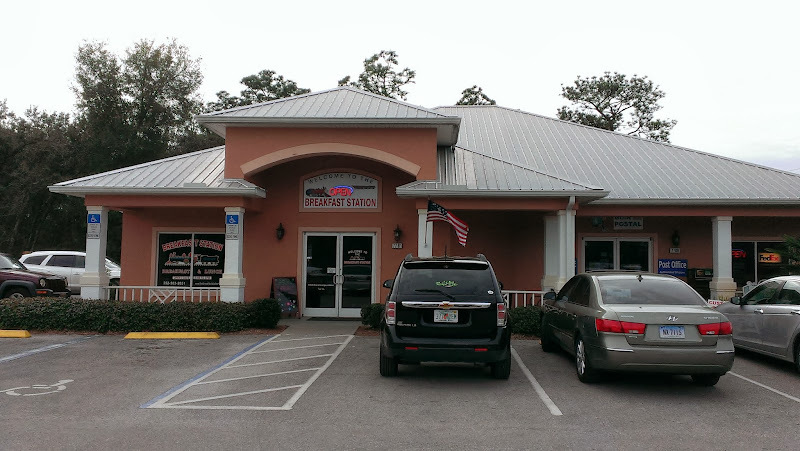 On our way into Crystal River, we had seen a restaurant, the Breakfast Station in Homosassa Springs, so we headed there for breakfast. 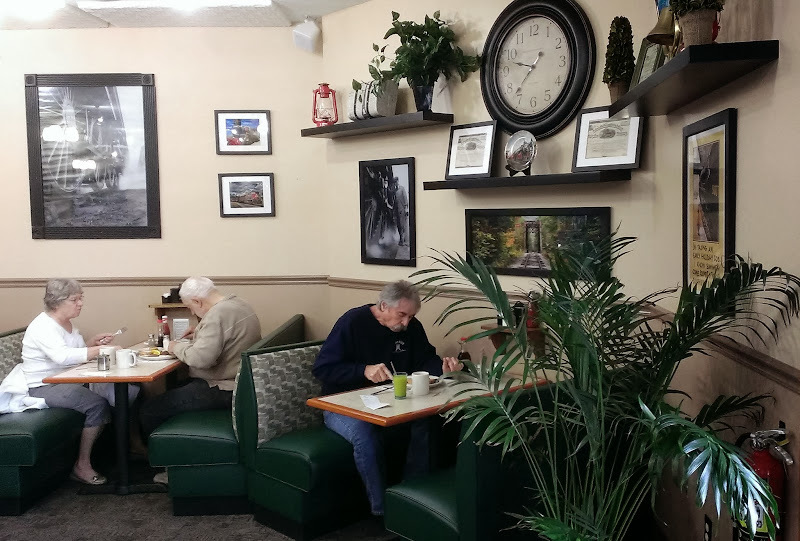 The Breakfast Station is a railroad themed small local chain but apparently the Homosassa location is new as it is not referenced on their website. Cute place, excellent service, reasonable prices and good food. 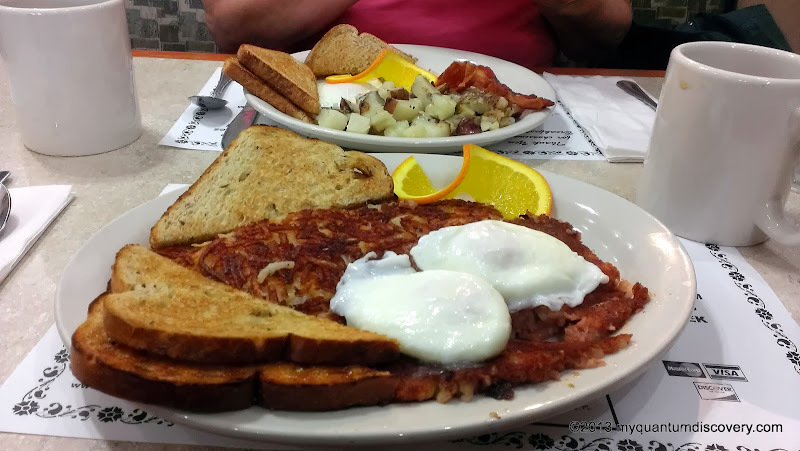 Rob had poached eggs on corned beef hash and I had 2 eggs with bacon, hash browns and toast. After we returned back to the coach, we prepared for our departure. The departure routine is down to a science now – we’re so quick now, despite our checklist we often stop and ask ourselves – what did we forget to do? A cold front had moved in so temps were a little cool (in the low 50’s) and rain was in the forecast, but our next leg was only going to be about 47 miles, about an hour of travel time. At 12:45, after checking out and hitching up the toad, we headed out onto SR-44. After a few miles we turned onto US-19/US-98N. The final leg of our short journey was on FL-121N then a short hop on SR-41N turning on to FL-500 (W Noble Ave) and finally a left turn onto NE 5th Street. 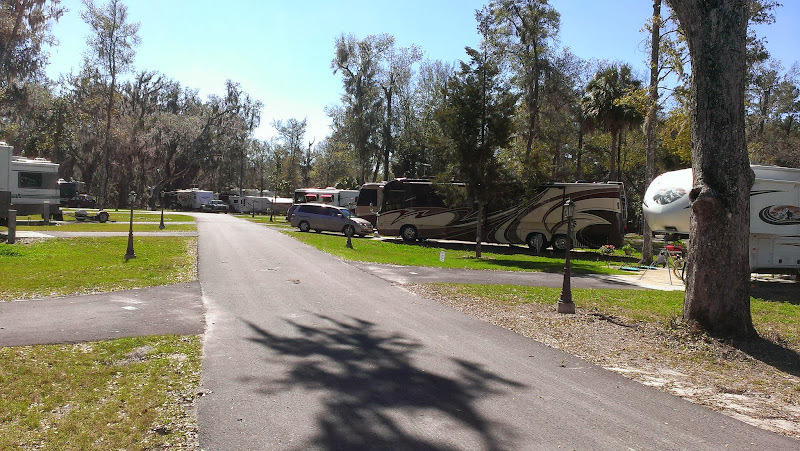 When approaching Williston Crossings RV Resort (located at 410 NE 5th St.) from E Noble Ave (FL-500) the Campground entrance is just a short distance down NE 5th St. on the right hand side. 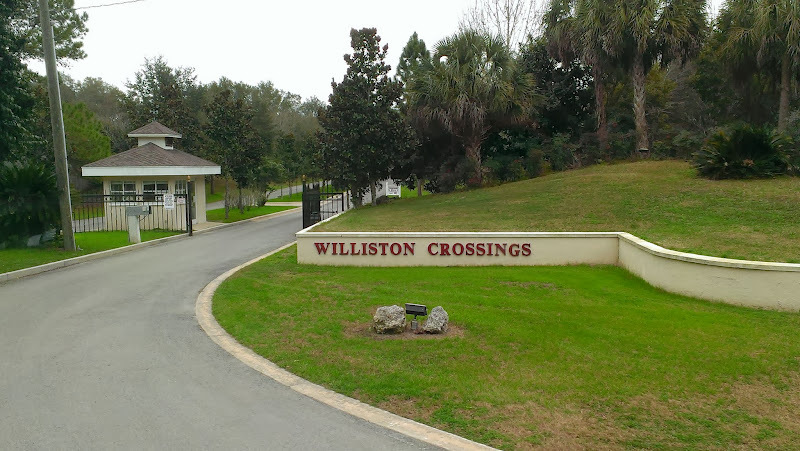 Be aware that there is a sign for Williston Crossings on E Noble/FL-500 but it can only be seen when traveling west. We were traveling east but it was no problem for us having been here in 2012 and knowing the ropes. Beware of directions from your GPS! The “idiotic piece of crap” (Rob’s words) Rand McNally wanted to take us on some wild goose chase. Mrs. Google (Google Maps running on an Android Smartphone) had it right though. To avoid confusing the more stupid GPS variants like the Rand McNally (7720 RVND equivalent), when traveling to Williston Crossings we recommend setting your destination to the intersection of E Noble Ave and NE 5th St. for best results. Do you get the feeling we are not too impressed with the Rand McNally? You’re right, Rob is planning to post a review at some point and is seeking a more reliable alternative. 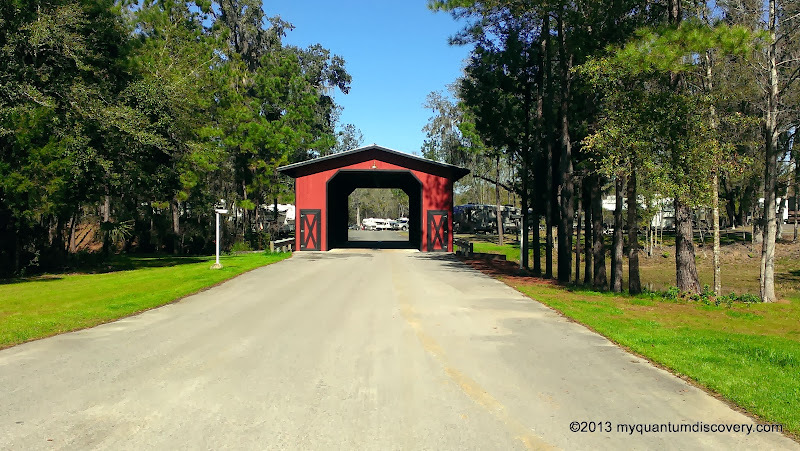 Since we were here last time, the resort has been expanded and there is now an additional “back” entrance on FL-121/NE 6th Blvd., but don’t be tempted to arrive this way as the gates may be closed and the main check-in facility is way at the other end of the campground. Once you’re all checked in and have the gate code this is a convenient alternative however. We wrote about our stay here previously so you can read all about it here. As one of Good Sam’s top rated parks in 2014, Williston offers a lot of amenities – 450 back in and pull thru sites with full hook ups and cement pads, wide asphalt roadways, free cable/wi-fi, pool, fitness center, pavilion, gated entrance, large clubhouse, gazebo fire pit, tennis, pickle ball, shuffleboard and lots of activities! You can also wash your RV here if you purchase a wash permit at the office, but if you ask they will give you a complimentary wash permit when you check in. There is also a dedicated car wash station in the South Park section of the resort, not to far from the pool and clubhouse. Rates here for a back-in site are $38/day or $216/week ($31/day) including a 10% Good Sam or military discount. Monthly rate for a back-in is $627 plus electric or $3600 annually (<$10/day). 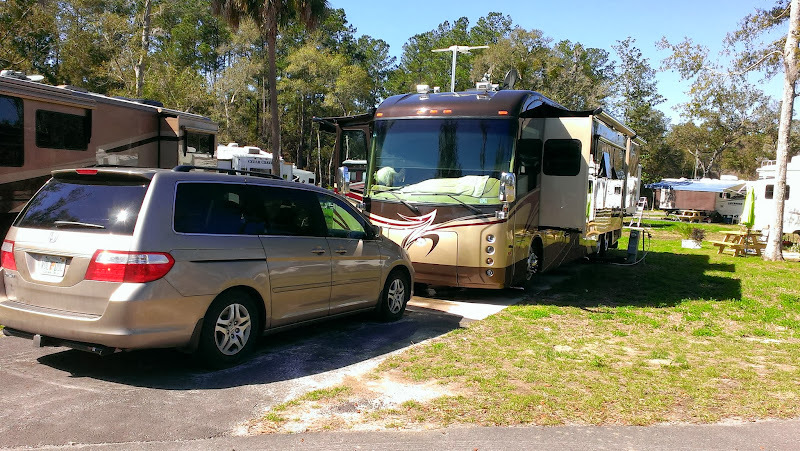 On our last visit we snagged a 50% off Passport America rate but that program has now been discontinued. Although, they do have a special for first time visitors – $109 for a week which is an even better deal than PA. Many of the sites here are annual rentals so people have upgraded their sites with storage sheds, decorative pavers, plants, etc. Checking in at the office, we were greeted by several friendly resort employees. One nice touch was that they had a “Welcome To” white board on the porch with a list of the names of the people checking in that day. 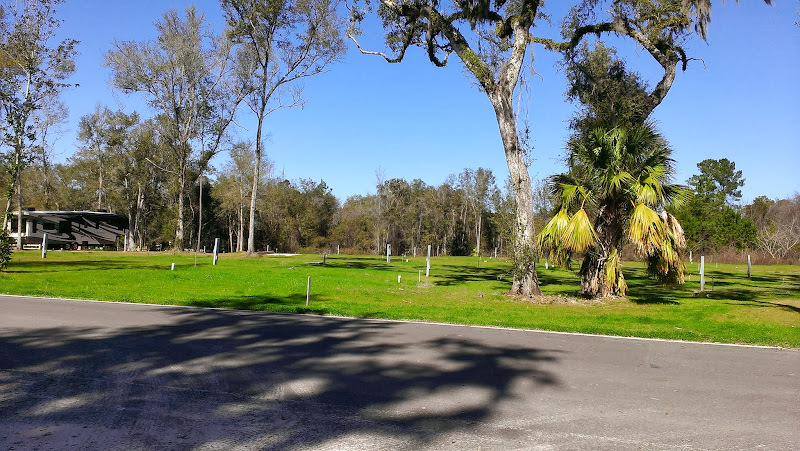 When we made our reservation, the only sites that were available were in the new North Lot (they now have a total of 450 sites) so we were assigned to site #191. After unhitching the toad, we were escorted thru the resort by Bob in a golf cart. Bob helped Rob back into the site which was relatively easy. Although the sites in North Park are mostly fairly big, level and paved with cement pads, North Park is rather stark (at least in the section where we are) without many trees or shrubs so there isn’t any privacy between sites. It seems a lot less “homey” than the South Park older section but that will probably improve over time. Some of the sites are close together and others are widely spaced with no apparent rhyme or reason. Great for satellite reception though – after being without it for a week, we were both looking forward to having our DVR capabilities back. Some sites had nice, relatively new, wooden picnic tables but ours didn’t so I asked Bob about it. Apparently only rentals of a month or more get a picnic table. 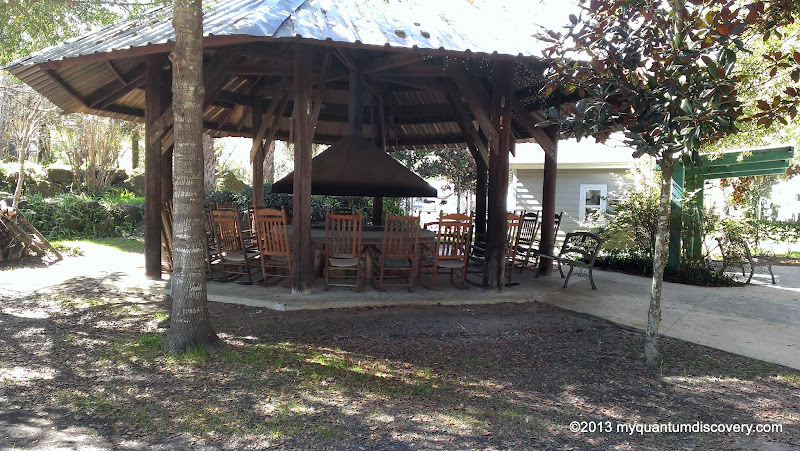 Lots of amenities but not every site has a picnic table. Huh, what’s with that? When I questioned him about the possibility of getting one, he told me that I should check with the office. Since we’re only here for 10 days, not sure if we will bother. In general we would not choose the site we are on (#191) again as there are much better choices. Most of the pull-thrus seem to be much larger in the newer North section and the pull thrus in the South Park older section are long and more private with intersite vegetation. We suspect, given the mix of owners/seasonal renters/park models, that this resorts appearance could degrade further over time if uniform regulations are not enforced. As mentioned above, at the back of the North lot, there is a new entrance from FL-121/NE 6th Blvd. complete with a passcoded gate and check in building. We are not sure if that building is staffed however so you should check in at the NE 5th St. entrance. 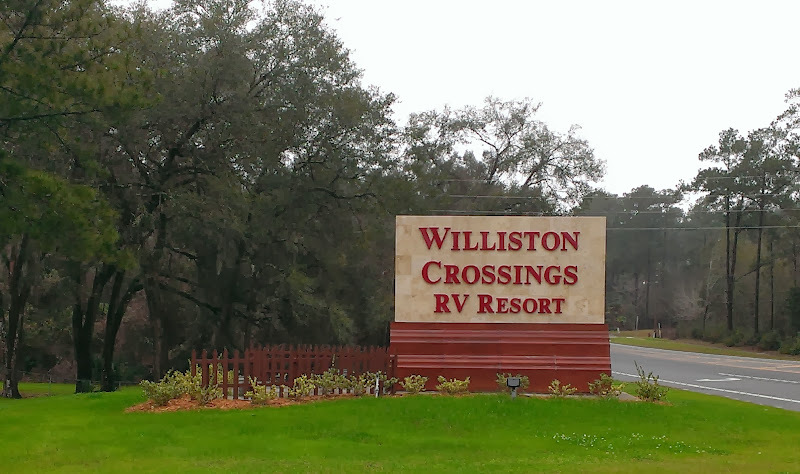 After passing thru the gates at this entrance you will be greeted by “Williston Reserve” signage. Apparently this end of the resort is being developed for ownership lots and park models, but so far the sites are all empty even though all of the electrical and plumbing work in the area has been completed. We also wondered about some old dilapidated railroad cars that are in the middle of the North Park. According to Bob they are going to make these cars into rental apartments, 3 per car. That’s interesting! Some people might not want to stay in North Park because it is relatively close to railroad tracks. 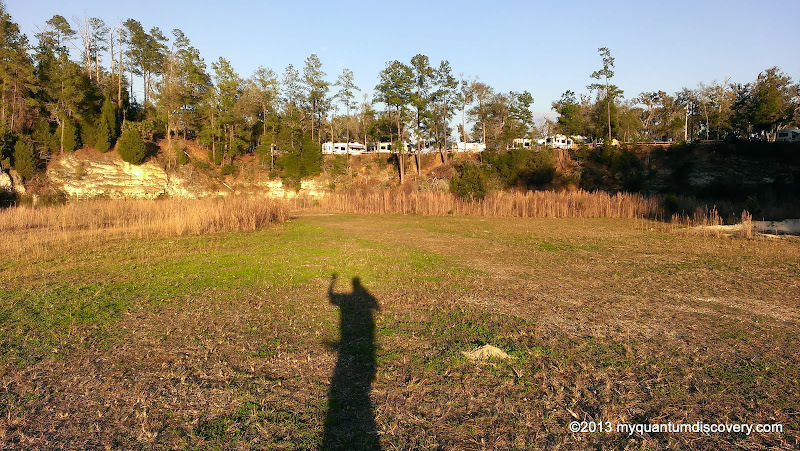 In fact some of the undeveloped sites where the park models will be are probably less than 50 feet from the tracks. About once a day, or so it seemed, a train would go rumbling by tooting its whistle. I guess it could be annoying but it was so infrequent, it didn’t really bother us during our stay. 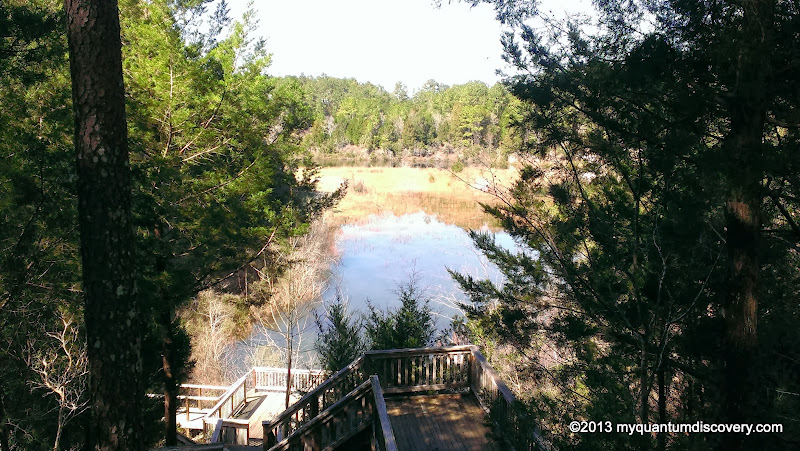 Behind the pavilion, there is a path to the now abandoned rock quarry. You can either walk or bike down the steep dirt path or use the wooden stairs for the descent. In the quarry there are a couple of “ponds”, a defunct dock, dump area for brush and discarded vegetation, plus a variety of old cars, trucks and even a fire engine. 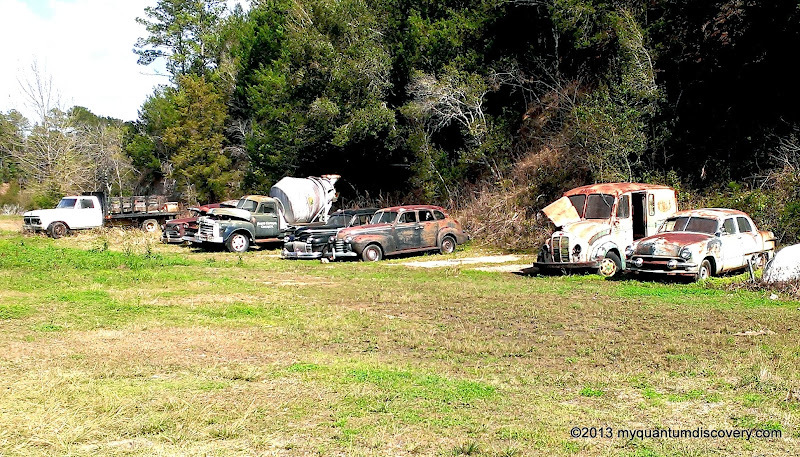 From what we hear the previous owner was an avid antique car (and fire truck) collector – we also heard that most of his collection has already been sold off so these are just the remnants. Some of the sites in North Park are located along the edge of the quarry so they have an interesting view. OTA TV reception is good and satellite reception will be most trouble free in the new north section. We did not try the cable but others seem to like it. Good Verizon 4G LTE signal and also well dispersed and strong wifi if you have a signal booster. Rob set up our new Pepwave SOTG router/WiFi repeater and we had strong and good performing WiFi for all our devices and were even able to stream several programs we needed to catch up on. The Pepwave also tethers to our Millenicom (Verizon) MiFi 4620LE cellular device and is super simple to switch our entire network between WiFi and Cellular without changing the settings on any of our devices. More on this in a separate post. Good biking here too as the resort is large and varied with somewhat hilly terrain. Making it back up the steep quarry road is a challenge. Rob also enjoyed some of the dirt trails around the park. 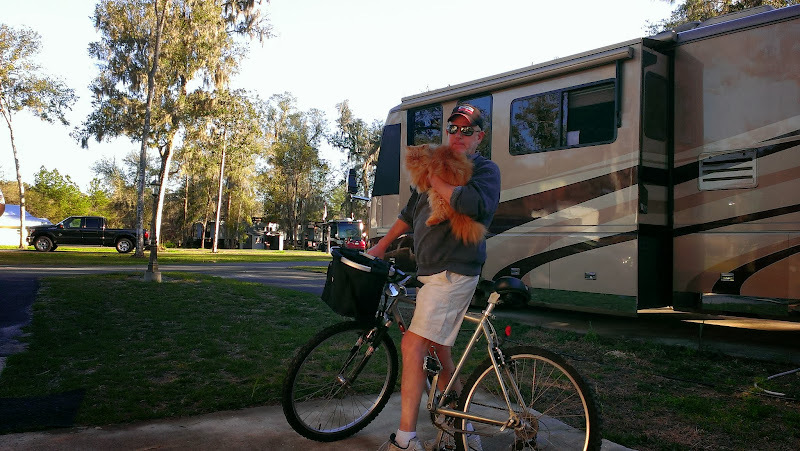 Once we settled in, we took a bike ride around the park, then settled in for the evening. Stay tuned for more about our visit to the area. 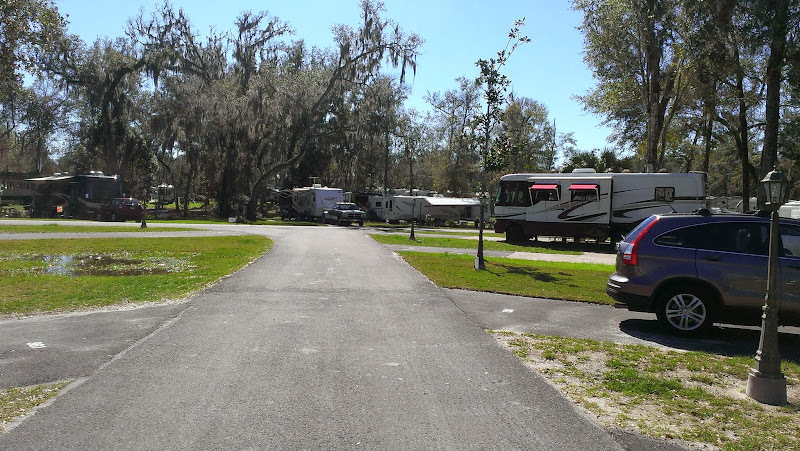 Great campground review! Hope we can join you for breakfast someday!